Eclipta alba ,the divine herb used by ancient siddhas & saints. It helped them to perceive the spiritual power from the ecstasy existing in the form of sound & light. 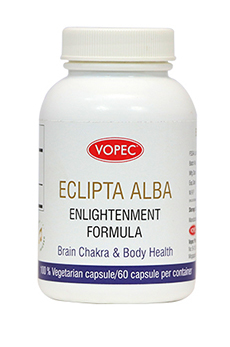 This Mantra energized Eclipta alba links deep source of brain energy, supports in self and spiritual awareness, changes the thought process & removes karma of a person taking this herb. Enlightenment formula is a rejuvenator, revitalizes the skin and hair cells. Ancient siddha treatises mention that Eclipta alba enhances complexion and makes the skin glitter like that of gold. It helps to grow hair thick, strong and black. It is a liver rejuvenator too. Eclipta stimulates blood detoxification, fat metabolism and blood glucose regulation. Sharp awareness & improvement in judgmental capacity. What is unique in this? This is the phoneme enhanced formula, infused with specific brain chakra sound vibrations increasing the potency of the herb.